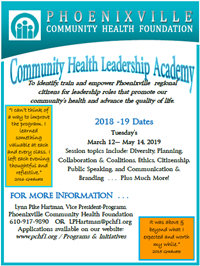 The programs and initiatives of the Phoenixville Community Health Foundation are geared to the fulfullment of our Mission … To Advance the Health and Quality of Life of the People of the Greater Phoenixville area. To that end many are designed,implemented and funded solely by the Foundation as non-profit capacity building programs. Others are collaborative efforts with the Foundation taking a leadership role in the design, implementation and funding. Whether community and civic leadership or non-profit capacity building, the Foundation strives to be a Champion of the greater Phoenixville community.